Before we start, I know the Italian and English versions of the title seem to be at odds, but that’s simply because here in Sicily clementines and tangerines tend to go by the same name. The fruit I used seemed to me to be tangerines, so that’s what I’m calling them. Not that it really matters – either can be used. Although we usually munch on these sweet shots of citrus in a half-hearted attempt to atone for our various Christmas excesses, the bon vivants among you will be glad to hear they can actually be used to contribute to our excesses. Today’s recipe is tang(erin)ible proof. I have tried making orange risotto before, but have never been entirely satisfied with the results. The fresh flavour of the fruit seems to get diluted and lost in cooking. So I decided to go for overkill. This meant switching to the richer flavour offered by tangerines and using not just the juice, but also fresh grated zest, caramelised slices and fruit powder. 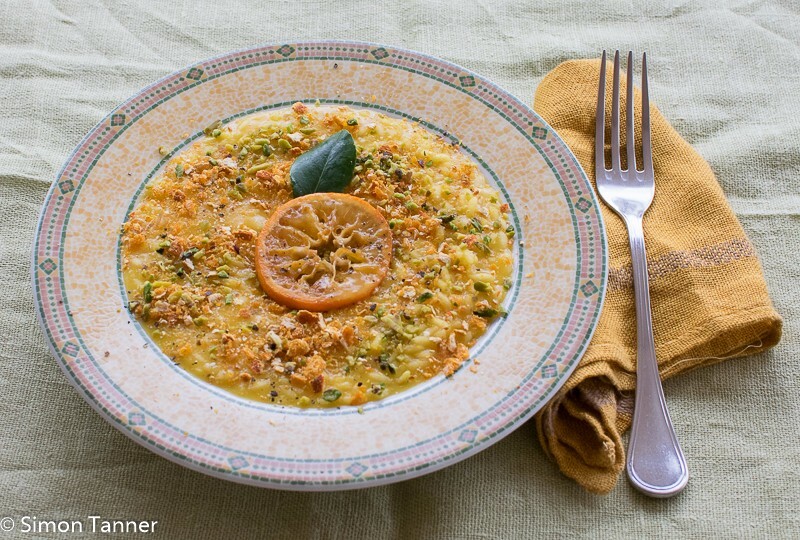 It is the fresh zest and the powder that really make the difference, since they are full of the tangerine’s essential oils, resulting in an aromatic risotto that remains creamy while expressing intense fruit flavour. I won’t pretend this is traditional, since I invented it myself, but the flavours are as Sicilian as you can get. The pistachios are not really necessary, I’ll be honest. I added them to provide interesting contrast, both visually and in terms of texture, but if you can’t find them, don’t worry – the risotto will taste hardly any different without. This recipe takes a certain amount of advance planning (i.e. the tangerine powder), but it’s well worth the effort. 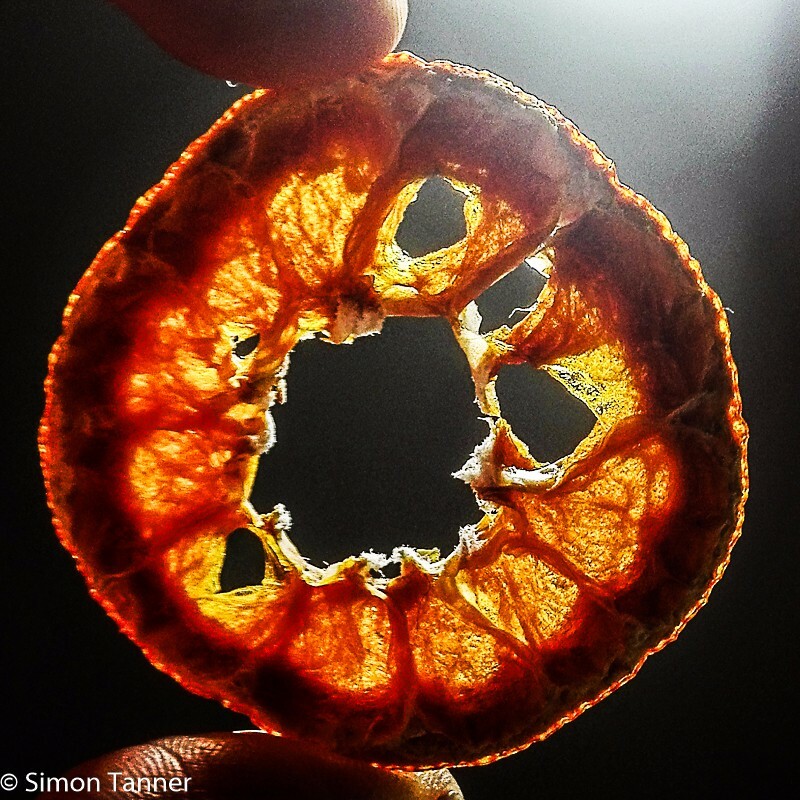 Before starting to cook the risotto, prepare your tangerines. 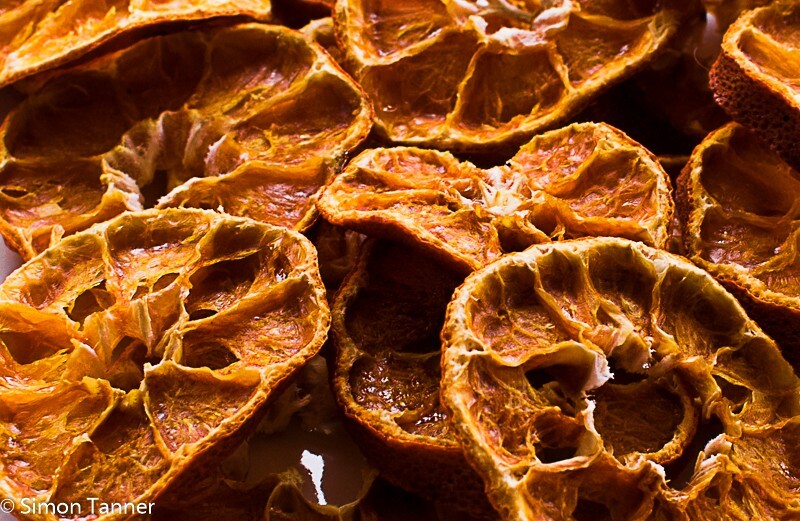 Grate the zest of five tangerines and set aside, then peel and juice the tangerines. You need about 300 ml of juice, so if you don’t get enough juice from five, juice an extra couple (hence the 5-7 specified in the ingredients list). Before you start, make sure your stock is extremely hot and can be kept that way, for example in a pan over a low heat – risotto needs to be fed with boiling hot stock, otherwise you will lower the temperature and your rice will absorb too much liquid before it’s cooked. Toast the rice in a hot pan with the merest pinch of salt and a tablespoon of oil, stirring frequently. Add the grated tangerine zest and mix to release its essential oils. Deglaze the pan with the gin and 200ml of the tangerine juice, stirring continuously. When all the juice has been absorbed, add the oregano/thyme, the saffron and a ladleful of hot stock. Continue cooking over a medium heat, adding stock a ladleful at a time as it is absorbed, moving the pan rather than stirring (unless the rice sticks to the bottom, of course), frequently but gently. Continue until the rice is al dente, which should take between 15 and 20 minutes (although the time indicated on the packet should give an idea). Stop cooking when the risotto is still fairly liquid – it will become denser as it cools and when you add the grana cheese and butter. Don’t worry if you have stock left over – the quantity specified in the ingredients list is purposely excessive, just to make sure you don’t run out, which would be a disaster for your risotto. You may find that a litre is enough. Remove from the heat and fold in the butter, grana and the rest of the tangerine juice. Ladle out into bowls and garnish with a twist of black pepper, chopped pistachios, tangerine powder and slices of caramelised tangerine. This entry was posted in Ingredients, Rice and tagged clementine, fruit, rice, risotto, tangerine by hungryenglishman. Bookmark the permalink.